Maybe someone can help me. A couple of weeks ago I went swimming and my ear filled up with water and I could not hear anything and I kind of hurt. I am curious why this happened and if ther is any thing I can do to help it of prevent it. you will probably have noticed that your ears do funny things in an aeroplane, or on a train when it drives into a tunnel, in a car when you drive up (or down) a mountain, when you go diving, or when you have a bad cold. Most people describe the sensation as a 'pop' and can 'equalise' (restore their ears to normal) by holding the nose closed whilst attempting to blow down it. This works because the ear consists of an outer ear canal (the bit you can put your finger into) which ends in a thin membrane called the eardrum. The eardrum seals off the ear canal and prevents things, including fluids, from moving any further into the ear. 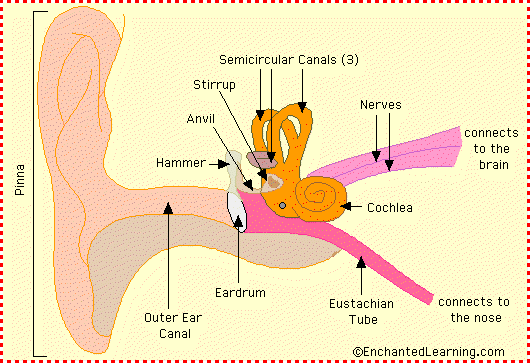 Behind he ear drum are your body's three smallest bones, known as the ossicles, the malleus, incus and stapes (hammer, anvil and stirrup) which convey vibrations from the eardrum to the cochlea, the ear's nerve centre where sound is converted into electrical nerve energy. The space that the ossicles (ear bones) sit in is called the middle ear cavity, and it is connected to the back of your nose via a thin passageway called the eustacian tube. There are two, one for each ear. You need these tubes so that sound waves can compress the eardrum, otherwise whenever a sound wave tried to make the eardrum vibrate it would have to compress the gas in the middle ear, making it difficult to hear any quiet sounds. As your nose is connected to your ears, if water flies up your nose sufficiently quickly it can be forced along the eustacian tube and into the middle ear cavity where it produced unpleasant squelching sensations ! It is slowly absorbed by the cells lining the cavity, and also disappears by evaporation, but it can take a few hours. This is why people abandonning a ship, or jumping feet-first into water from a reasonable height, are advised to hold their noses. Otherwise the nose acts like a great funnel and collects water to ram into itself...with very unpleasant effects ! Just wondering how you intend to get the gauze into the middle ear where the water is ?! You should never put anything in your ear which is smaller than your elbow! I dive recreationally and I get ear problems if I don't equalize properly. I have to equalise at least every few feet or the pain is unbearable. Sometimes it takes me ages to descend. I have kinked ear canals and I have to be careful if I want to continue diving. If I make sure I equalise my air spaces then I enjoy diving with no problems it's just harder for me than it is for other people. It doesn't stop me diving just takes longer to get down. I get problems when I swim and sometimes I go deaf for days and lose my balance. Once I needed suction at the local ENT clinic. Chris, all this ear stuff is very interesting. Presumably any one of these components if damaged would render the person deaf....Can the hammer, anvil and stirrup be repaired ? replaced ?..or any other of the components ? I assume that if the nerves that connect to the brain are damaged then there's very little you can do ? Do people who are born deaf share, for the most part, the same reason as to why they are deaf ? Chris, thanks for the info. I to get water in my right ear whenever I put my head under water. And I do water aerobics, so wearing ear plugs is NOT an option, or I can't hear the instructor. It's the same ear that I used to get frequent infections when I was a kid. Some kind of link there I think..
MissB, have you tried earplugs? I have to wear them occasionally when I'm working, and while background noise is mercifully deadened, I find I can still hear voices. Try to become a good listener and do not be harsh while speaking. You can do this by removing the guilt feelings within you of having done something wrong knowingly or unknowingly. Once the guilt feelings are removed there will be no ENT problems. But till this happens through meditation, you should take prescribed medicines also. Um, willl the guilt take the water with it? Just asking. Page created in 0.203 seconds with 72 queries.